Welcome to Episode #059 of Linux in the Ham Shack. 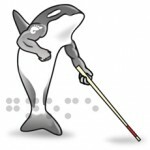 On this edition, we talk with Jonathan Nadeau of Frostbite Systems about Linux for the sight impaired. Jonathan, being a blind Linux user, has overcome many challenges when it comes to using his favorite operating system and he shares with us the ins and outs of accessibility on Linux systems. There is a Linux distribution dedicated to blind users called Vinux, along with an accessible version of Arch called Talking Arch. Even newer versions of Slackware are jumping on the bandwagon with a Speakup enabled installation kernel. This is also the first episode of LHS with a blooper reel left in at the end. Listen all the way to the last so you don't miss out on any of the fun. Many thanks to Jonathan for his time and expertise, and many thanks to our listeners for making our show so fun to do.